The liver is key to the optimal health of the body. Shouldering the heaviest responsibility for keeping the body’s internal terrain clean, the liver not only filters toxins and cellular by-products out of the blood like other excretory organs, it also neutralizes poisons, microbes, heavy metals, and carcinogens. By supporting the liver, we support the health of the entire body. 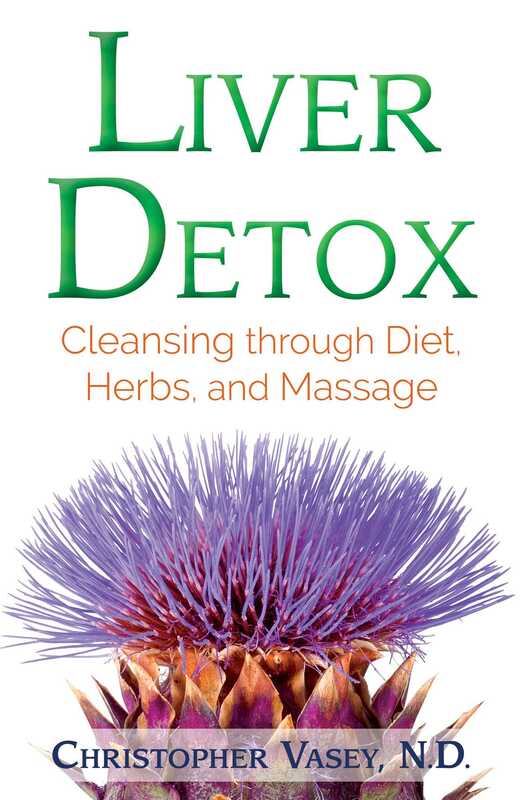 In this practical guide to cleansing and detoxifying the liver, Christopher Vasey shows how many features of modern living--such as overeating, medications, cigarettes, alcohol, food additives, and environmental pollution--overtax this powerhouse of an organ. This leads to weakening of the liver and congestion with toxins, which in turn can lead to illness, including cardiovascular problems, allergies, headaches, constipation, respiratory issues, and skin conditions, as the toxins the overburdened liver cannot filter out find their way to other areas of the body. Detailing how the liver functions, the author explains how to use diet, herbs, massage, and other practices to detoxify, strengthen, and regenerate your liver. He includes simple charts and questionnaires to help you determine to what degree your liver function is compromised. He shows how a simple change of diet along with the use of hepatic herbs will often have immediate benefits for the liver and the immune system. He explains specific foods to avoid and how taking supplements, such as trace elements of sulfur, accelerate the liver’s ability to neutralize heavy metals. He details 9 plants that are most effective in detoxifying the liver, such as dandelion and rosemary, and provides instructions for their safe use. He also describes liver exercises and massage techniques as well as the use of external aids, such as a hot-water bottle, to stimulate liver activity. Offering an accessible yet detailed approach to supporting the liver, the author shows how bringing the liver back to full health and function has far-reaching effects for the whole body. In addition to diet and herbs, there are other, external methods for stimulating the liver and ensuring its proper functioning. The hot-water bottle is an extremely effective method for stimulating liver function. The liver is the warmest organ in the body with a temperature of 102°–105.8°F. The execution of the liver’s many functions produces a great deal of heat. The liver is not only accustomed to working at this temperature, it needs to be this warm to function properly. Heat loss in the liver will slow down the rate at which it performs. This can occur when a person has been weakened by illness but is also a result of overexertion; stress; nutritional deficiencies; or, quite simply, not dressing warmly enough. The drop in temperature has a vasoconstrictive effect on the capillaries of the liver. Their diameter shrinks, which slows circulation and reduces the amount of blood they contain. Normally, the liver is particularly well-supplied in blood. It weighs 3.3 pounds dry and 5.5 pounds when gorged with blood. Blood, which circulates in the sinusoidal capillaries that snake between the hepatocytes, therefore represents almost half of the liver’s weight. A loss of blood in the liver will slow its functioning. The filtration and elimination of wastes will be weaker. Fortunately, this can easily be remedied by the application of heat. Placed over the area of the liver, the heat from a hot-water bottle is transmitted to this organ, causing its temperature to rise. Its blood capillaries dilate, which automatically increases the quantity of blood in the liver. It will go back to its normal level and may even exceed this level during the time the hot-water bottle remains over the liver. The liver will emerge out of its torpor and resume functioning with pep and efficiency. • Place the bottle filled with hot water on the body over the liver. The hot water from your tap should be hot enough; water heated in a kettle would be too hot. The hot-water bottle can be placed over clothes or directly on the skin. • Leave it in place for fifteen to thirty minutes. Begin with short sessions (ten minutes) then gradually increase up to thirty or forty-five minutes. Remain still enough that the hot-water bottle does not slip out of place, either sitting or lying down. • Apply one to three times per day, preferably after meal time. The liver is not only an organ rich in blood, a strong current of blood also flows through it (1 liter a minute out of a total of 5 liters of blood in the body). The liver needs all this blood to perform its functions properly. Congestion of the liver is characterized by the stagnation of blood and wastes inside this organ. Like a vicious circle, the slowdown of blood circulation fosters congestion of the liver as the momentum of the blood coming in is no longer strong enough to push the blood already in the organ. Physical exercise, which accelerates circulation in general, is one means of remedying this stagnation. The purpose of these bending exercises is to exert pressure on the liver and gallbladder in such a way that it causes the blood they are holding to drain. Because these exercises compress the blood vessels of these organs, the stagnant, waste-laden blood they contain is pushed farther into the circulatory system. The void thus created in the blood vessel is immediately filled by new, well-oxygenated blood. By repeating the movements several times, the liver is alternately compressed and decompressed. You can think of it as a sponge that is cleared of the dirty liquid it is holding as it is squeezed and released in succession. • Interlock your hands behind your head, elbows extending to either side. • Perform lateral bends alternately to the left, then to the right, in rhythm with your breathing. • Breathe in when bending to the right so that your lungs full of air will squeeze the liver more effectively. • Perform three sets of 10, 20, or 30 bends per day, with a rest between each set. • Begin in a seated position. • Join your hands together at the nape of your neck, elbows extending to either side. • Lean forward until your torso touches your knees. • Breathe in while bending forward; exhale as you rise back up. • Perform three sets of 10, 20, or 30 bends a day, with a rest between each set. When the liver is functioning properly, all the blood contained in the human body will travel through it every five minutes. When the liver is congested, the blood flow is obviously less than it should be. Restoration of normal blood flow through the liver, and even an increase in this flow, can be obtained by physical activities that cause breathlessness. Your muscles need oxygen to work. The more intense the muscular activity the more the body’s need for oxygen increases. To address this need, we breathe in more deeply and rapidly to absorb the maximum amount of oxygen possible. This acceleration in breath rate causes an acceleration of blood circulation, as it is the bloodstream that transports oxygen to the muscles. The muscles then receive oxygen quickly and in large quantity. This is why running out of breath is a sign that blood circulation has increased, and it is this breathlessness we seek to obtain through exercise. Any physical activity has the potential to cause breathlessness, though the most effective are those that place demand on the largest muscle masses of our bodies, the thighs. The strong breathlessness that results from exercises concentrated on the thighs--such as squats, running, or biking--can double or triple the speed of the bloodstream and, consequently, blood’s passage through the liver.